Glamorgan fans have cheered Indian all-rounder Ravi Shastri and Pakistan fast bowler Waqar Younis, recruited as overseas players in the 1980s and 1990s respectively. Former India captain Sourav Ganguly also played five matches for the county in 2005. But although south Wales' West Indian community delivered Tony Cordle and Rupert Hill in the 1960s and 1970s, the county is yet to field a local player of Asian descent. Around half of the more than 30,000 people of Asian descent living in Cardiff are of India and Pakistan origin. "It has been disappointing to think nobody has made it to Glamorgan," said Mo Sadique, secretary of Welsh Asians Cricket Club in Cardiff. "Cricket has always been a passion in the Asian community and it is surprising that none of that passion has been turned into something more substantial in terms of professional cricket. "But I don't think there's a simple answer to it." For Welsh Asians Cricket Club, the largest club of its kind in the country, the lack of facilities is a particular problem. "Our club doesn't have a permanent home ground and that doesn't allow us to tap in to some of the talent that's out there," said Sadique. And although Glamorgan have traditionally had a strong relationship with Saturday leagues, research by the England and Wales Cricket Board suggests South Asian cricketers are generally unwilling to travel far for matches, often a prerequisite for competitive club cricket at the weekend. "At the younger age, people tend to stick with people they know and they might not wish to travel," said Sadique. "When we offer net sessions we're inundated with demand but making the effort to go somewhere else perhaps doesn't exist in our community. "There are family pressures within the Asian community [because cricket] might not be seen as a credible career to some." Socialising and drinking is also a common post-game activity, but Sadique says pub culture discourages some British Asians who want to play competitively. "I know a couple of guys who played at a decent level but one of the reasons they stopped playing was because at the end of the game they didn't drink. They just wanted to go home," he said. Nearly 50% of the 800 cricketers registered in the Cardiff Midweek Cricket League are of Asian descent but this preference for social cricket is a concern for Richard Almond, Head of Talent Development at Glamorgan. "There is a lot of midweek Asian cricket [but] only one or two clubs partake in the leagues on a Saturday afternoon," said Almond, who added there is "a wide range in standards" in grassroots development programmes in Wales. "[Our] academy programme is a huge commitment. There needs to be a good support structure." Worcestershire's Moeen Ali, of Pakistani descent, starred for England against India in the Test series this summer. Leg-spinner Adil Rashid, also of Pakistani heritage, helped Yorkshire win the County Championship title. Leicester, meanwhile, is one of the most ethnically-diverse cities in the UK with 38% of the population being of Asian descent. Leicestershire's 22-man first-team squad contains three (13.6%) British Asians. One would-be Glamorgan professional is Imran Hassan who was born in Lahore, Pakistan, and moved to Newport with his family as an eight-year-old. He joined the Glamorgan academy as a 14-year-old in 2006 and was tipped for a big future in the game as a leg-spinner and batsman. In 2007, he was voted the outstanding young cricketer in England and Wales, winning the John Hobbs Memorial Award ahead of current internationals Joe Root and Jos Buttler. Hassan was offered a deal by Glamorgan when he was 16 but could not sign it as he did not hold a British passport. He took his case to the Home Office but is still awaiting his documentation. In 2011, he dropped out of Glamorgan's academy and now works for his uncle's mobile phone business in Newport. "It's disappointing. You wake up in the morning for work and you think: 'Did I really want to do this?'" said the 22-year-old. "If my passport was there, where would I have been? It's a question I ask myself every day." It is an issue out of Glamorgan's control but efforts are being made to improve links with minority ethnic groups. 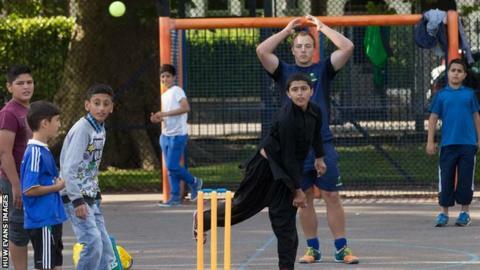 The county and Cricket Wales ran four pop-up cricket sessions in Cardiff's culturally-diverse Grangetown during August and September, giving 150 children from the Asian community a cricket experience. "In the past we've not done as much both in our local community and in the Asian community as we would have liked," said Owen Burgess, Community Cricket Manager at Glamorgan. "We've looked to change that this season and we've started to reap some rewards. "A lot of these children have taken up cricket, been to see Glamorgan or came to the recent one-day international." Glamorgan now hope to expand the sessions into surrounding areas and would like to see a competitive local cricket club established in Cardiff's south. "There's a big pool of talent out there that we haven't tapped into," said Almond. The county certainly need new talent to inject fresh impetus into a squad that has won just three County Championship games this season. But Glamorgan are optimistic for the future, with the likes of Prem Sisodiya, 15, and Mujahid Ilyas, 14, helping Cardiff Cricket Club win the South Wales Premier Cricket League title this season. "At under-14 and under-15 level, we've got three or four really talented Asian players," said Almond. "We've got high hopes that one or two of those will come through." Hassan, meanwhile, has remained in contact with Glamorgan and hopes to resume his career once he receives his passport. "I haven't given up. It's something I've worked hard for all my life," he said. "I want to play for Glamorgan and I want to play for England."